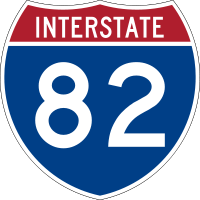 On Saturday, September 26, 2009, we drove the length of Interstate 82 in Washington, worse known as State Route 82. Desert wilderness, big rivers, and plenty of vineyards and cornfields -- with nary a stoplight to be found! 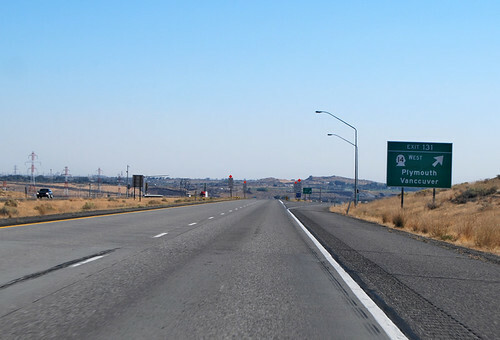 Beginning at a junction with state route number 90 in the vicinity of Ellensburg, thence southerly and easterly by way of Yakima, Union Gap, Sunnyside, Prosser, Kiona, and Goose Gap west of Richland, thence southeasterly near Kennewick and southwesterly by way of the vicinity of Plymouth to a crossing of the Columbia river at the Washington-Oregon boundary line. 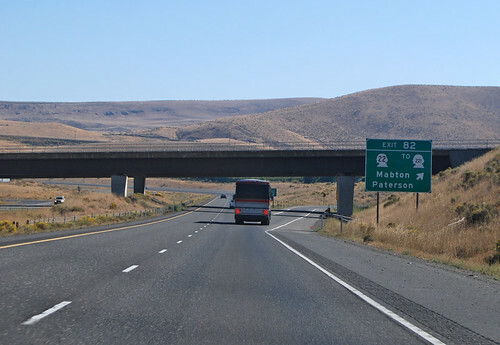 In the heart of the Kittitas Valley, I-82 departs from I-90, heading south ("east") for Yakima. Up and over I-90 we go. 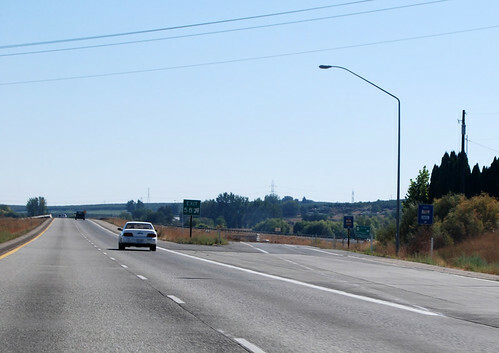 After a couple miles, slightly closer to Manastash Ridge, we find the junction with SR 281, which will take you through the Yakima Canyon on the old highway which once was US 97, following the railroad tracks. Nowadays, the signs for US 97 take you on I-82 over the ridges, without so many twists and turns as the canyon. After those ridges and past the Army's live-fire training center (a huge swath of shrub steppe rugged wilderness), we descend back to the Yakima River at the city of Selah. Here we find the other end of SR 821. 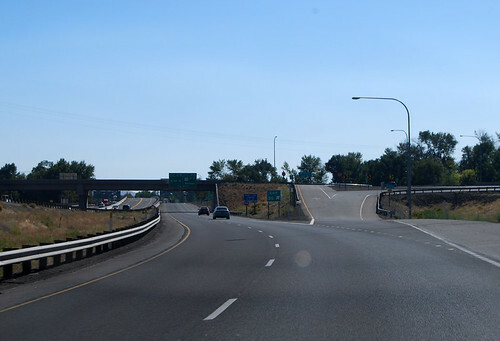 At the south end of Selah, just after you cross under the railroad tracks while going through the river's cut in Yakima Ridge, you come to the junction with SR 823. 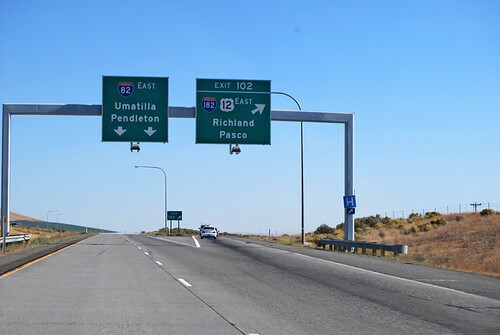 Shortly thereafter, just after a bridge over the Yakima River, I-82 meets US 12. I hope they like each other, since they share a roadway for many miles. 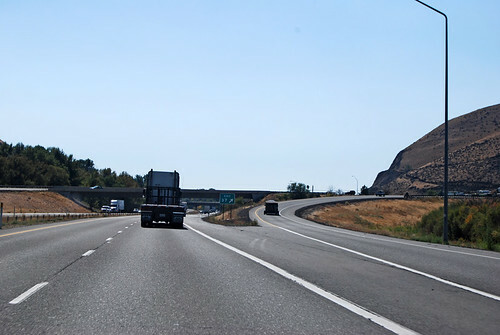 As we fly past Yakima, I-82 has a junction with SR 24. This is all so familiar. Just before going through Union Gap, US 97 departs I-82 for the other side of the river. Squeezed through the quarter-mile-wide gap between Ahtanum Ridge and Rattlesnake Hills are two freeways, a local road, two railroads, an irrigation ditch, and a rather large river. A bit crowded, if you ask me. 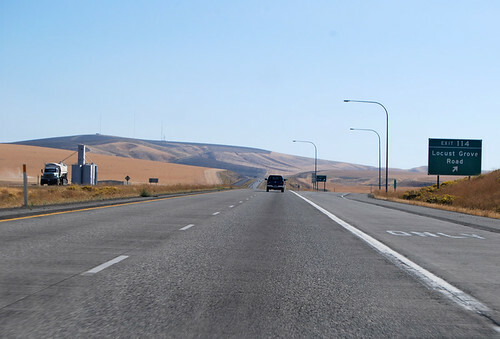 Out onto the expansive Lower Yakima Valley we escape, finally heading more east than south. 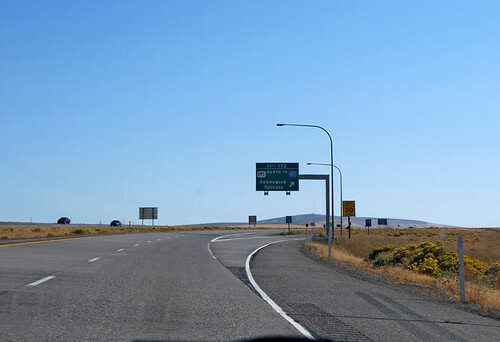 Soon, we're at the western junction with SR 22. Would you like to go to Toppenish? The Yakama Nation RV Park only charges $15 for tent camping -- and they have a big screen tv and free coffee! Wake up, Chunlin! 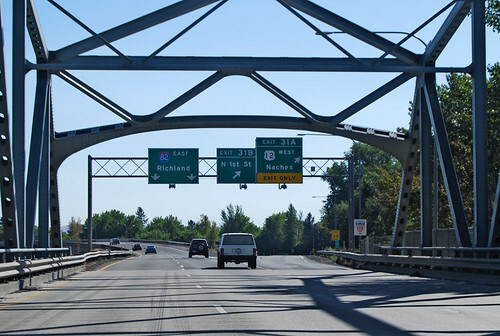 It's the junction with SR 223! A few more miles down the valley, the junction with SR 241. The nearest city is Sunnyside, but it's not signed here, since the previous two exits would've worked better for going there. I find it odd that Vernita Bridge is signed, since you'd have a hard time finding Vernita on any map. I would have expected WSDOT to list Vantage instead. But I guess they really want you to go to Mabton. We are now at the eastern junction with SR 22, about to go up the side of the Horse Heaven Hills. 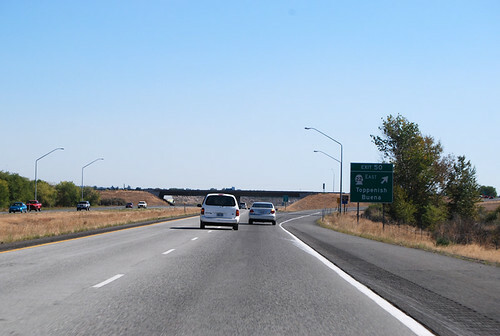 I-82 returns to the Yakima River near Benton City, at the junction with SR 224, which in turn has a junction with SR 225 about fifty feet north of the freeway. This would be a good place to stop for a while, if you'd like to go wine tasting at the small yet distinctive vinticultural region of Red Mountain. Find a place where you can sit in the shade and enjoy the view and the warm breeze, too. 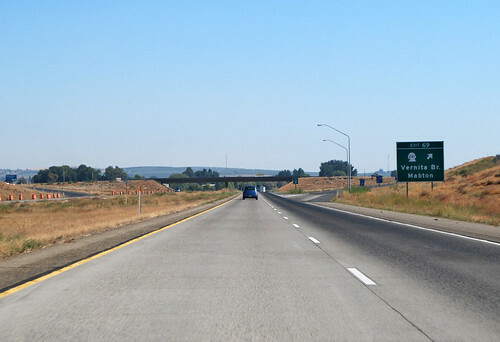 I hope you didn't sample too much wine, because we're back on the freeway and at the junction with I-182. We also say goodbye to US 12 at this point. 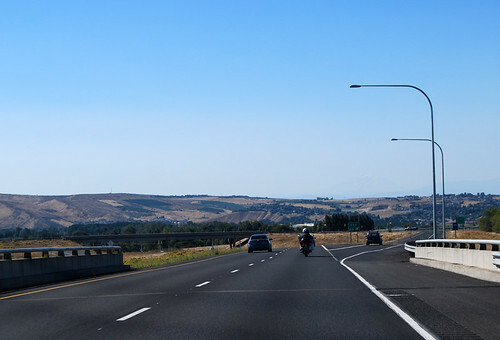 We're at the Tri-Cities, by the way -- although I-82 just skirts the edge of town through farmland, etc. 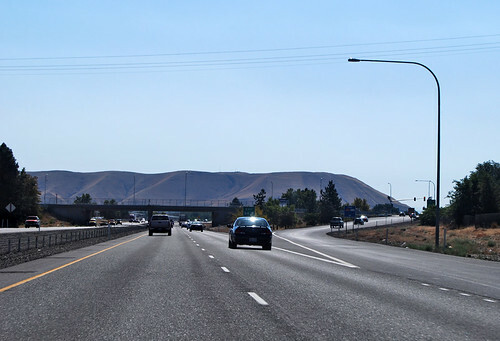 Up in the hills west of Kennewick, I-82 is joined by US 395. Loop back around here to head north into town. 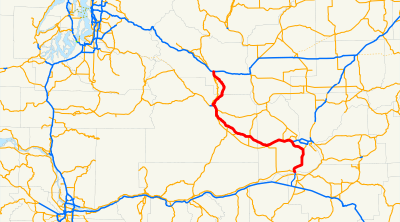 This is the point where I-82 gives up on going eastward and heads due south instead. 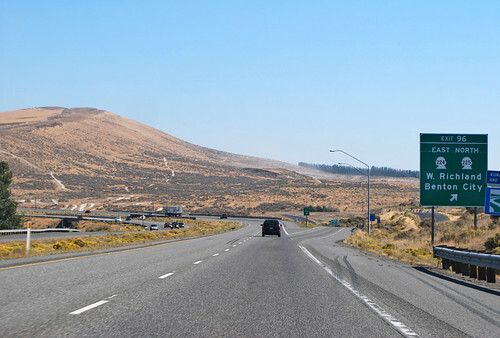 A mile later, we have the unsigned junction with SR 397, which officially got extended to here only two months ago. 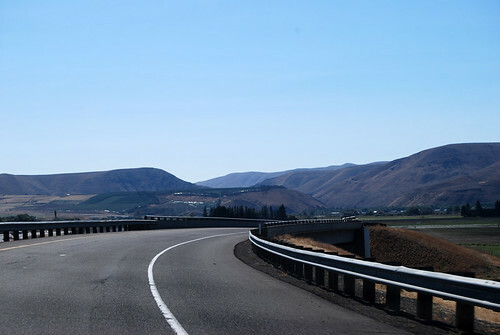 The "intertie" road joining I-82 to SR 397 down by the Columbia River was completed last year as a county road, then the state legislature ammended Highway 397 to include the new road, as of July 26, 2009. After heading southwest for a while, we descend to the Columbia River. Oregon is in sight! Oh look, it's SR 14. It will take you to Vancouver -- but not Portland! 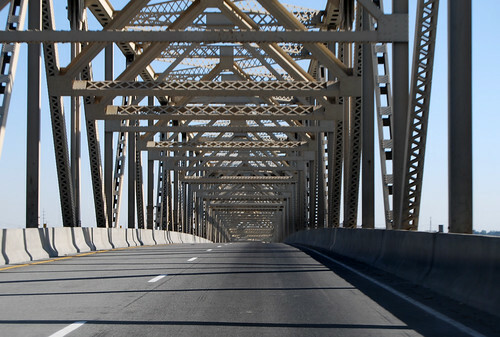 They slow us down to 55 mph as we approach the Columbia bridge, then up we go! Around about the high point on the bridge is the state line, right down the middle of the deepest channel of the river. Welcome to Oregon. It feels like a different country. . . 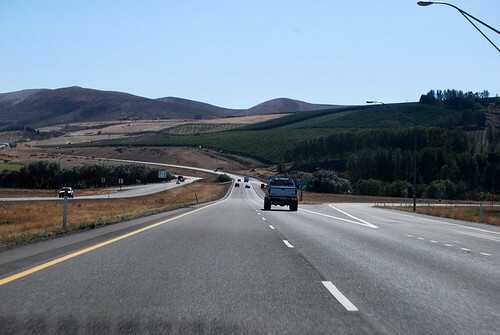 It's nice to drive a freeway for a change -- no stopping and always a passing lane. Also: is it always sunny in southeastern Washington, or is that just a coincidence? It's always sunny and warm during the summer months in SE Washington. I grew up in Lewiston.